Well I missed watching it live because I forgot that Brussels is an hour ahead of us here in the UK but the EU Parliament has declined the opportunity to postpone their vote on ACTA today. The European People’s Party, as they promised, called for a postponement of the vote. This was rejected by 420 MEPs. 255 voted to postpone and there were 9 abstentions. 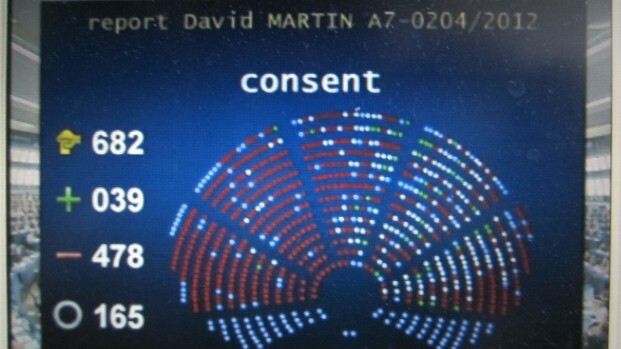 The Parliament then decided to reject the ACTA agreement itself (478 votes to 39, with 165 abstentions) based on ACTA rapporteur, David Martin's recommendations. 3. Instructs its President to forward its position to the Council, the Commission and the governments and parliaments of the Member States and of Australia, Canada, Japan, the Republic of Korea, the United Mexican States, the Kingdom of Morocco, New Zealand, the Republic of Singapore, the Swiss Confederation and the United States of America." The BBC and ZDNet have short reports as do lots of other outlets now, including the Parliament press office. The voting process itself was remarkable and courtesy of modern technology you can see it for yourself in glorious technicolour via the EU Parliament website. The ACTA discussion starts at 12.51.30 local time but it's worth watching the run up to it if only for the incredible speed at which votes get done on important agricultural issues. The ACTA bit takes only 6 and half minutes in total. Honestly if you were to blink you'd miss a vote. Or if you lost concentration you could find yourself voting for one thing thinking it was something else. On ACTA Christofer Fjellner of the EPP opens proceedings at 12.51.46. To applause in the chamber he asked for a postponement of the ACTA vote since the European Court of Justice was scheduled to consider the agreement. This was supported by Klaus-Heiner Lehne, again to a spattering of applause, rounding off with the old classic "I don't think that people on the internet should be making up our minds for us." (In fairness to Mr Lehne that was a translation of what he said rather than a precise quote from his native tongue). "ACTA has been rejected by 5 parliamentary commitees. It has been killed off so many times that it now only exists thanks to the EPP life support machine. No emergency surgery, no transplant, no large period of recuperation is going to save ACTA. It's time to give it its last rites. Time to allow its friends to mourn and for the rest of us to get on with our lives. Thank you Mr President." The vice president then moved to the vote on the motion to postpone. 255 in favour, 420 against, 9 abstentions. He quickly moved then to the substantive vote on ACTA making clear that those who wanted to reject ACTA should vote against it. The vote went 478 to 39 to reject. 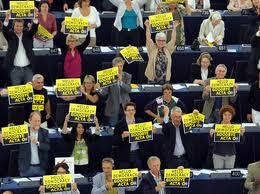 There was immediately huge applause in approval of the decision and a demonstration from multiple MEPs, standing up with posters reading "Hello Democracy Goodbye ACTA". Their revelry brought disapproval from the vice president, who like a teacher reprimanding a naughty child, told them to sit down and put their posters away. There was then a sting in the tail for the celebrating MEPs. Mr Vidal-Quadras said "The agreement has not been accepted by parliament and so I shall give the floor to the Commission. You have the floor Commissioner." Maroš Šefčovič, Vice President of the Commission and Commissioner for Inter-Institutional Relations and Administration (bet you didn't know we had one of those! ), stood up to make a brief statement. He referred to what had been said by Commissioner De Gucht earlier in the plenary (ACTA was coming whether they liked it or not) to "underline the importance of ACTA for creativity, innovation and the economic potential inthe EU. How important the agreement is for the external competitiveness of the EU economy." He was, therefore, "informing the honorable members that the Commission will maintain its request to the European Court of Justice for an opinion on whether ACTA is compatible with the treaties and in particular with the Charter of the fundamental rights of the European Union." He was loudly heckled at this point and the camera cut to David Martin shaking his head. There was also some applause. He went on to state that they would study the opinion of the Court and discuss it with the other signatories of ACTA and with the EU Parliament and "would then consider further steps to take." I caught the last few minutes of David Martin's press conference after the vote. Surprisingly, given the furore surrounding ACTA, it only lasted a little under 17 minutes (possibly because it is a busy news day elsewhere?). Mr Martin emphasised his concerns that ACTA is too vague, open to misinterpretation and could endanger fundamental freedoms. He spoke of the need for a wide ranging debate about the Internet and appropriate methods for rewarding creators whilst protecting fundamental freedoms. He believes we have spent 20 years dealing with the internet as if it was a physical world which it is not. To be pedantic, the Net has a very substantive physical layer. However, I absolutely agree with the underlying point that regulators should make an effort to understand the technology they are trying to regulate. He was asked a question about the other countries that have signed ACTA. Mr Martin responded that the agreement has 11 signatories. To come into force it needs 6 of those to ratify. But his considered view is that ACTA is dead, not just in the EU but elsewhere. He has information to suggest Australia will follow the EU lead and reject ACTA in parliament next week. It is not clear now if Canada will ratify the agreement and he thinks it will now struggle to get the 6 ratifications it needs. In a none-too-oblique retort to Commissioners De Gucht and Šefčovič that ACTA was alive and kicking whatever the EU Parliament said, Mr Martin also said that he believed that the agreement could not be put before the Parliament again. There might be some legal or procedural loopholes that he was not aware of but as far as he understood ACTA has now been permanently killed off in the EU. Irish MEP Seán Kelly had apparently asked why India and China were not signed up for ACTA and the response was ACTA was a "coalition of the willing". More like "a coalition of the innocent" thought Mr Kelly since most of the IP infringement came from China and India in his opinion. And the final speaker was rather amusing too, if unintentionally. Eija-Riitta Korhola from Finland launched into an angry rant about how we must protect intellectual property, how "we've made ourselves laughable", how MEPs had let themselves be misled on ACTA by false information from the media, that ACTA was fair and the Parliament should have waited for the ECJ decision which would have been evidence based before deciding whether ACTA was a good thing or not. ACTA seems to have been an emotional issue for her. So where does this all leave us with ACTA? Well the EU Parliament has now firmly rejected the agreement by a large majority. The Commission, however, Ian Paisley style, says NO! They're not having tin pot democratic institutions like the EU Parliament getting in the way of them ACTAing (sorry, couldn't help it) in the economic interests of the EU by implementing ACTA, so they're promising it will be back, like the Terminator. ACTA may be temporarily on ice but I don't share David Martin's confidence that it is dead. It will return again once the ECJ has considered it and its provisions are likely to re-surface in any case as part of the EU's ongoing discussions on IPR enforcement. But for now those opposed to the agreement can give themselves a pat on the back for winning one significant battle. Update: IPWatch, KEI and Michael Geist are worth reading. Lilian Edwards and Daithí Mac Síthigh tell me that the 7th Gikii workshop is scheduled 16 & 17 September at UEA London. 7th Gikii 2012 - call for papers!! It’s harder than it used to be to write a Call for Papers for GikII, the so-cool-it-hurts blue skies workshop for papers exploring the interstices between law, technology and popular culture. Back in the day, you could dazzle the noobs just by mentioning past glories like the first paper on Facebook and privacy, Harry Potter and the Surveillance of Doom, regulation of autonomous agents according to the Roman law of slavery, edible technologies and copyright in Dalek knitting patterns. But nowadays we live in a world where we routinely encounter unmanned surveillance drones used to deliver tacos or made out of cats , commercial asteroid mining with Richard Branson, 3d printers used to create human organs and the fact that Jeremy Hunt still has a job. Still, if any of these or the other many phenomena of the digital age in desperate need of legal attention are digging a tunnel out of your brain, then send us an abstract for the 7th Gikii workshop! Maybe this year it will be your paper which contributes the seminal GikII meme following in the honoured footsteps of LOLcats, flying penises, and knitted Daleks. Abstracts of no longer than 500 words should be sent to lilian.edwards@strath.ac.uk and "Karen Mc Cullagh (LAW)" K.Mccullagh@uea.ac.uk by August 13th 2012. Acceptances will be announced shortly thereafter. A limited number of places will be available for participants not giving papers, and preference will be given for these to scholars (including postgraduate students) who have not previously attended GikII. Registration for these places will open at gikii.com when acceptance of abstracts is notified. Gikii is one of my favorite conferences. Always thought provoking, friendly and enjoyable. And you get to talk about anything - my own (fairly staid by Gikii standards!) back catalogue includes Maxwell's demon and the internet, the battle of the book, airborne minefields and Fighter Command's information system, a Wilson-Boyle plan to save the public domain, teaching algebra with tiddlywinks, going OER without permission. Daithi Macsithigh, "What We Talk About When We Talk About Google"
Dinusha Mendis, "If Music be the food of Twitter - then tweet on, tweet on"
Judith Rauhofer, "The Rainbow Connection - of geeks, trolls and muppets"
Martin Jones, "Human! We used to be exactly like them"
Miranda Mowbray, "What the Moai know about Cloud Computing: Stone-age Polynesian technology and the hottest trend in computing today"
TJ McIntyre, Won't somebody please think of the children!? Lilian Edwards, Ian Brown, Chris Marsden, "Cybersalking 2.0"
Andrea Matwyshwn, Black Collar Crime Daithi Mac Sithigh, "I’m in ur tube blocking ur internets: The Politics, Perception and Parody of Network Neutrality Legislation" Burkhard Shafer Wiebke Abel, and Gerald Schaefer, "An Officer and a Gentleman: Teaching Autonomous Agents the Laws of Armed Warfare"
I could go on but it's time to tune into ACTA vote at the European Parliament. On Gikii 7 - make it if you can!